I was lucky enough to spend the past few days in beautiful, but cold, Park City, Utah, representing Constant Contact at the MediaPost Email Insider Summit. It's one of my favorite conferences of the year (just like the spring edition, held in Captiva Island, Fla.), but not because of the location — that's just a bonus. The Email Insider Summit is a chance for leaders in the email marketing world to come together and take a pulse on current trends, and to join together for the sake of industry unity and collaboration. We are very lucky to be in an industry with so many smart, passionate people, and it's always exciting to "talk shop" with them. Speaking of engagement, there was an excellent keynote on Tuesday by Augeo Marketing's Chief Marketing Officer Ken Greer about the subject, and how engaging customers is not a single event, it's a process. "The end game of engagement is not a click," Ken said. "It's driving sustainable business performance." How do you get people to engage with your business or organization? Ken said it comes down to one of three things: You offer a reward, you provide group validation, or you communicate values that you share with your customers, clients, members, and supporters (by using more humanized content). But more than that, you have to ask. Too many marketers forget to solicit for comments or feedback, or to link people to a place where they can engage with you. Like Ken said of the staff at the event venue, they don't just tell you where to go, they actually take you there. Do that with your email subscribers and you'll get more engagement. 3. What do you do about inactive subscribers? The most vigorous and longest-lasting debate of the conference had to do with reengaging inactive subscribers. AlchemyWorx CEO Dela Quist challenged attendees to rethink how they define "inactive" subscribers/customers because someone may not be clicking on your email messages, but he or she is still seeing the subject lines, and that makes an impression (hopefully a good one) that isn't counted in an open rate. Further, that so-called "inactive" subscriber could be engaging with you in other channels. That may be true, but no one really wants "unemotionally subscribed" people on their list, right? To bring these people back, YesMail Senior Creative Director Matt Caldwell suggested conducting a re-engagement campaign that doesn't use a negative tone or acknowledge the unwanted behavior (i.e., not saying "We miss you" or "Come back"). Instead, try a positive message like Hewlett-Packard did: Not too long ago, it sent a "Thank you" message to inactive subscribers. That campaign's more positive tone generated a high response and was considered a success. One slightly amusing side effect of having so many panels at MPEIS was that it became clear very early on that what worked for one business wasn't the same thing that worked for another. So the phrase "it depends" was uttered quite often. For small businesses and organizations, it's a good reminder that one-size-fits-all best practices don't exist. There is no one best time for everyone to send an email. The best kind of content for you is not going to be the same for another business or organization. And so on. To know what will work, you need to know what's already working. Look at your metrics and get to know your customers, clients, members, and supporters better. Then you'll get the direction you seek. Like social media, the topic of mobile marketing permeated many of the panels and presentations. Why? 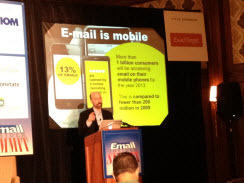 Because more than 1 billion consumers will be accessing email on their mobile phones by the year 2013. (By comparison, fewer than 200 million did so in 2009.) How is this affecting email? Interestingly, mobile open rates are going up, but click-through rates for mobile readers are going down. Email marketers need to adjust their design and content so messages are shorter, have compelling subject lines, are easier to read, and perhaps most importantly, so a reader can act on the content easily. As Litmus Marketing Director Justine Jordan said, Nothing is more frustrating for a consumer than wanting to follow through on a call to action and not being able to. Be simple, specific, and obvious if there's something you want your mobile readers to do. Do you have any thoughts on these subjects? What's your biggest takeaway from this list? Please leave a comment here or on our Facebook Page and let me know.